This material is based upon information which we consider reliable, but because it has been supplied by third parties, we cannot represent that it is accurate or complete, and it should not be relied upon as such. These offerings are subject to errors, omissions and changes including price or withdrawal without notice. ©MMXV Sotheby’s International Realty Affiliates LLC. All Rights Reserved. Sotheby’s International Realty® is a licensed trademark to Sotheby’s International Realty Affiliates LLC. An Equal Opportunity Company. Equal Housing Opportunity . Each Office is Independently Owned and Operated. If your property is listed with a real estate broker, please disregard. It is not our intention to solicit the offerings of other real estate brokers. We are happy to work with them and cooperate fully. Any origin, any destination. Let us help you LIV the life you love. 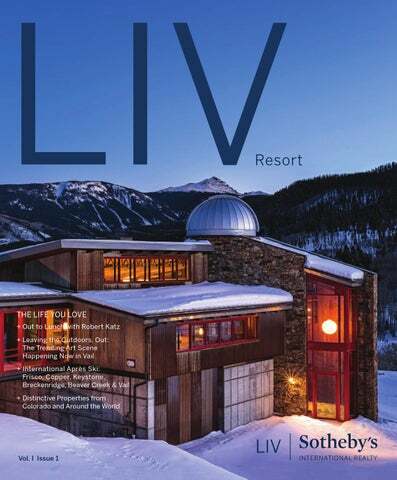 Welcome to the Resort edition of LIV Magazine , and to winter in the Colorado Rocky Mountains. Our signature print publication, LIV Magazine, features some of our area’s finest properties for sale and many wonderful opportunities to spend more time here. For those of us who love to ski or snowboard, and enjoy the outdoor activities and beauty of winter, it doesn’t get any better than the world class resorts of Vail, Beaver Creek and Breckenridge. Coming off a season opening with the best snow conditions in the country, this ski season promises to be one of the best ever. whether it’s the winter or summer, adds a therapeutic, inspirational dimension to life’s hectic pace like few others. How fortunate I feel to have been able to personally enjoy and share the mountain outdoor lifestyle with my family and friends. The memories are priceless. see why Colorado’s many ski towns are considered among the very best in the world. 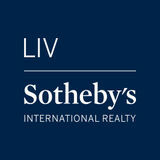 And the LIV Sotheby’s International Realty offices and brokers in Vail, Beaver Creek, Edwards and Breckenridge are uniquely positioned to mobilize our unmatched resources in introducing you to the right opportunity for you and your family. No other brokerage firm has the local, national and international reach and connections like Sotheby’s International Realty to help you make important decisions when buying, selling or owning a resort or recreational property. We are proud of our exclusive affiliation with Sotheby’s. We are here to serve you and to help make your visit most memorable. And we are here to give you sound information, responsible advice and valuable service when you make a move in our real estate market or just about any real estate market in the world. Realty throughout the Vail Valley, Breckenridge, metropolitan Denver and Boulder, welcome to Colorado. Please visit any of our offices or connect with one of our professional brokers if we can help make your visit even better. We hope you have a great trip! asked a friend what I should ask Robert Katz, CEO of the now global $4 billion ski enterprise, Vail Resorts, if given the opportunity to interview him. His response was, “for free lift tickets”. Even if Katz, once Wall Street investment mogul turned ski industry marketing guru, isn’t doling out lift tickets for free, he has made the sport accessible to more people, in more destinations, and for less money than ever before with the introduction of the Epic Pass to the ski industry. While many have heard of the Epic Pass, a season pass that gives holders access to Vail Resorts’ 11 mountain resorts, as well as Arapahoe Basin in Colorado and five days at Verbier, Switzerland, few are privy to the genius behind its making. “One of the challenges for the ski industry in the last decade was how to create more consistent skier visitation,” said Katz. “There was always fluctuation surrounding weather. We had to ask ourselves, how do we increase visitation from our guests?” In a market whose success is measured in snowflakes, Katz has been involved with Vail Resorts since 1991 as a board director and became CEO in 2006. His first challenge was to come up with a way to drive ticket sales in a relatively volatile industry. With a job that requires him to answer to the market, not the weather, Katz devised an unexpected plan to increase ticket sales; he lowered the price. Ten years ago a season lift ticket at Vail Mountain cost $1,800. Less people were skiing, operational costs kept climbing, and a successful year was dependent on snow. “We reduced the season pass price to $579 in 2008,” said Katz. “There was a huge uproar in the industry. People thought that we had made a mistake and rushed to purchase ski passes thinking this incredible deal was going to go away.” While the deal wasn’t going anywhere, the catch was that skiers had to purchase the pass before the season began. They would be locked in, regardless of weather, with the winner-take-all benefit of a drastically reduced season pass price and unlimited access to multiple resorts. Overnight, Katz had introduced a game-changing initiative to the ski industry, carving out a unique way to drive ticket sales, while simultaneously creating more options and accessibility to skiers. “We then held the lower price of that season pass to make sure it stayed affordable (7 years later, the Epic Pass cost $789 in fall 2015), but we’ve increased a single day [lift ticket]. If you want to show up on the middle of Christmas, you’re going to pay a higher price, but for everyone else— it’s very reasonable,” said Katz. The Epic Pass has enabled skiers not to be priced out of the sport, resulting in a loyal following of the Vail Resorts brand, while also bringing opportunities for profit and growth. “Skiing is a very social sport,” said Katz. “If one person in the group has a pass; it’s likely they will drag everyone else to the resort where they have a pass.” In an industry where overall visit growth is only 1% per year, Vail Resorts has grown its sales of season passes 15% per year for the past seven years. And by introducing the Epic Pass to unique markets, Vail Resorts continues to increase its revenue. In 2012, the company’s purchase of smaller, less expensive resorts just outside the city in Minnesota and Michigan was intended, in part, to target beginning skiers and a more diverse population that could in time, graduate to Vail Resorts’ premier resorts. “Our branding around these small, urban resorts is that they are ‘where epic begins’. It’s where people start their ski experience. We felt if we could own smaller resorts, and improve them, all of a sudden we’ve created a season pass where people can ski locally, and eventually graduate to skiing out west.” In 2014, Vail Resorts acquired Utah’s popular Park City Mountain Resort, which the company recently combined with Canyons Resort, creating the largest ski resort in the country. “Park City and Canyons were right next to each other. The opportunity to combine them- it’s a once in a lifetime opportunity in the ski industry—it’s hard to create that kind of experience,” said Katz. Today, the price of the Epic Pass has increased some from its original cost, but has maintained its integrity of allowing more people to hit the slopes, at a lesser price than ever before. Despite the global enterprise Vail Resorts has become, its present leader won’t soon forget his company’s native roots. Brittanny Havard is Editor of LIV Magazine and Public Relations Manager at LIV Sotheby’s International Realty. Have a local innovator in mind for ‘Out To Lunch?’ Email brittanny.havard@sothebysrealty.com. While traditional accents like rusted beam and timber have long-adorned the facades of Vail’s iconic homes, the newest trend is happening inside of its residences. Trending now is an evolving art scene reflective of personal taste, instead of the surrounding environment. Savvy collectors, second home owners and Vail’s well-traveled international clientele are leaving the mountain motifs outdoors and embracing clean and contemporary art genres. Ebb by Granite Calimpong, blown glass, sheet glass, laminated and coldworked, 12” h x 12” dia. Piece Art Gallery. Two Vail gallerists who have witnessed this trend firsthand are Marc LeVarn, president and co-owner of Vail International Gallery, known for its contemporary works by emerging artists, and Eva Pobjecka, owner of Piece Art Gallery, which features works in glass. Both agree, with the abundance of new, fresh and easily attainable art in Vail, it is time to leave the mountain scenery where it belongs and embrace quality and choice, even when living in a mountain town. The variety of collections available at Vail International Gallery, a boutique gallery located in the heart of Vail Village, demonstrates that art’s only utility is to be lived with and enjoyed. Art does not have to match its surroundings, but rather, should complement them. The gallery offers exhibition space for visiting artists seasonally, and features a variety of paintings and sculptures from local and international artists, without relying on the mountain stylings typically found in a resort town. Piece Art Gallery (previously Pismo gallery), located directly in front of Vail’s main parking area, has been serving Vail’s patrons of the arts as a gallery offering unique and inspired pieces for over fourteen years. There, it’s all about embracing a hot new medium—glass. With the high level of art available in Vail, LeVarn and Pobjecka are noticing that like the vastness of the mountains that surround the ski resort and its suburbs, so are the options for meaningful, personalized art available in Vail, and their clients are actively pursuing it. Top, left: A Stolen Kiss by Ron Hicks, oil on canvas, 36”h x 48”w. Vail International Gallery. Top, right: Adriatico by Carlo Trost, original carved wood wall hanging sculpture, 61”h x 29.5”w. Vail International Gallery. The Glass Movement Pobjecka has seen a growing interest in what she describes as urban art among her second home owner clientele. “It’s finally here, and I really applaud that trend. To me, it’s very pleasing to keep our forms and decorations simple when within the home, and to admire the nature that surrounds us when outside of it.” Pobjecka views glass as a new medium of art that the most avid of art collectors are beginning to embrace. The dramatic nature of glass is captivating to collectors. “Glass is not only interesting as a final medium, but in its original state, it is very primal. Glass is sand and other chemicals, which when heated to a certain temperature, changes dramatically. The involvement of basic natural materials: sand, fire, and human breath that create the glass piece is very dramatic.” Two contemporary glass artists featured in Piece Art Gallery are Granite Calimpong and Steven Ciezki. “It’s really interesting what’s new with the current glass masters,” said Pobjecka. “Calimpong—he is fulfilling the aesthetics of simplicity and using a minimal and almost retro aesthetic in his approach. Steven uses very unusual retrospective forms. His works are more elaborate, and he adds these wonderful pastel colors.” By introducing glass into their art collections, buyers are adding beauty to their home environment, without necessarily mirroring the outdoors. Top: Piece Art Gallery Top, right: Read Between the Lines by Steve Ciezki, blown glass, 41” h x 7,5” dia. Piece Art Gallery Middle, right: Saltillo by Granite Calimpong, blown glass, sheet glass, laminated and coldworked, 11” h x 11” dia. Piece Art Gallery. Bottom, right: Where the Sharks Bubbles Blow by Wilfried Grootens, painted, laminated and polished sheet glass, 5” h x 8” w. Piece Art Gallery. By introducing glass into their art collections, buyers are adding beauty to their home environment, without necessarily mirroring the outdoors. LeVarn has also seen an influx of Vail consumers seeking quality over quantity in regards to art. “I think that the days of people coming in and spending $300 to $500 on a little print are over. They are just not interested,” said LeVarn. “You think it would be easier to buy something for less money, but nowadays people want something truly unique. They don’t need to know who the artist is; just something that stops them in their tracks—that’s what they desire.” Both owners of Vail International Gallery and Piece Art Gallery hold in high regard the traditional, mountain-inspired styles of art originally used to adorn the homes of Vail, but agree that today, art should be used to complement the surroundings of a home, not match them. A visit to Vail International Gallery and Piece Art Gallery offers the visitor a glimpse of the best of Vail’s contemporary fine art scene, where one can truly experience how art complements the beauty of the natural landscape Vail enjoys, without bringing that natural landscape indoors. Top, left: American Surfboard by Bates Wilson, original reclaimed mixed media sculpture, 82”h x 22”w x 17”dia. Vail International Gallery. Bottom, left: Still Life by Boris Chetkov, 1975, original oil and acrylic on board, 19.75”h x 14.5”w. Vail International Gallery. Bottom, right: Vail International Gallery. Visit us in-store or online everyday. Our wine specialists will help you shop for the best wines for all occasions. Pictured: 59 East Trade Court, Keystone. Offered at $3,199,000. BEAVER CREEK Take in the legendary Beaver Creek scenery with views of Centennial and Grouse Mountain, all from a lofty perch with direct ski access to Strawberry Park, just a short walk from the world-class amenities of Beaver Creek Village. Ski-in/Ski-out. VAIL This must-see custom-built home exudes quality and elegance. Perfect for entertaining, this one-of-a-kind estate incorporates design and technology unparalleled in the Valley yet is warm and comfortable for family and friends. Attention has been paid to every detail with unmatched lighting, electronics, landscaping, and architectural details. The finest workmanship is evident on both interior and exterior. Gorgeous outside spaces and stunning living areas make this a one-of-a-kind home. A beautiful ski-in home enveloped by hundreds of aspen trees that immerses you in a truly remarkable mountain setting. With two master suites, a media room and wine room, this amazing residence is the epitome of a true mountain retreat. Excellent floor plan with 6 bedrooms plus fitness room and an outdoor living experience that feels like your own private forest. Easy access to Beaver Creek Village only adds to this incredible home. BEAVER CREEK Experience year-round access to all the adventure and culture that Beaver Creek provides. Inside this 4 bedroom, 4.5 bathroom, mountain-modern home, rich walnut floors and granite and limestone accents radiate throughout the home and balance the natural light entering through large windows. Sweeping views from the open concept kitchen allow you to watch the snow fall on Strawberry Park and, with the ski lifts in sight, help determine the perfect time to hit the slopes. SQUAW CREEK ESTATE Ideally situated atop a majestic ridge spanning the renowned Lake Creek and Squaw Creek valleys, this contemporary mountain estate offers privacy, breathtaking views, and unmatched luxury features. Built for perfection on some of the most sought after land in the Vail Valley, the property contains an open-sided glass ceiling elevator that will travel 3 stories to the professional telescope observatory and to a state-of-the-art indoor tropical greenhouse that provides year round fruit and vegetables. A stately ski-in home situated on 1.75 acres with grand interior spaces provide the framework for this 9,300 square foot residence. The 8 bedroom, 9 bathroom interior received a $2 million upgrade in 2002 and can accommodate horses along with a secondary building on the property. This incredibly beautiful and private mountain setting receives gorgeous afternoon sun and has peek-through views of Beaver Creek Village. STRAWBERRY PARK This is the last available home site inside the gates of Strawberry Park. At almost 2 acres, this site offers seamless ski-in/out access, views to Beaver Creek Mountain and Village, views to the Gore Range and a grove of towering aspen trees that will inspire you. With approval already in place, it is easy to move forward the custom plans for a phenomenal 10,000 square foot home designed by VAG Inc. Architects. Your lot and residence will be like no other inside the gates of Beaver Creek. Every room in this 3 bedroom, 3.5 bathroom penthouse presents a breathtaking vantage point for the ski runs on Beaver Creek and Bachelor Gulch mountains. The fully equipped chefâ&#x20AC;&#x2122;s kitchen is adjacent to the dining and family room and a moss rock fireplace anchors the great room. Exquisite hardwood floors and 9 foot ceilings put the finishing touches on this spectacular penthouse. Enjoy full access to the Ritz-Carlton services and amenities, and your private terrace provides a front row seat to aprĂ¨s ski entertainment in the winter. MINTURN This magnificent estate provides a unique ownership opportunity on 10 acres in Minturn, just minutes to the resorts of Vail and Beaver Creek. Surrounded on three sides by thousands of acres of Forest Service land, this residence has unparalleled privacy and beauty. A mountain stream flows throughout the year along a manicured front yard and the Minturn Mile ski trail provides ski-in access to the residence from Vail Mountain. A very unique studio plus loft floor plan at Elkhorn Lodge. 2 baths, fireplace and ski slope views. A private residential setting walking distance to gondola, shops and restaurants of Vail Village. A furnished turn-key condo in the heart of the Village. Ownerâ&#x20AC;&#x2122;s access to 3 lifts and lodge amenities. L’AUBAINE: THE HOUSE ON SUNRISE POINT Imagine a place where vistas of snowcapped peaks take your breath away. Where serene gardens with inviting waterfalls welcome you to stay. Elegant quarters where the outdoors and indoors are one and the same with sweeping views of the Ten Mile Range and Baldy Mountain. Elements combine to create this Zen-like home. Your windfall is here. Introducing L’Aubaine: The House on Sunrise Point by award winning Architect Michaela Mahady. A contemporary design in the heart of Breckenridge Ski Country. An architect’s dream, an artisan’s touch and a vision to craft a masterpiece that will create a lifetime of memories. A timeless collection of log, stone, rough-cut granite and moss rock assembled to perfection configuring warm and open gathering spaces. Sites of Baldy Mountain and the enchanted landscape complement the true ski-in/ski-out access, hiking/biking trails in this pristine, tranquil setting with captivating water feature. The adjacent .96 acre lot is also available for purchase. Combining astounding views, incredible design, high-end finishes, rustic materials, and total privacy, the caliber of this home is amazing. Enjoy world-class summer and winter activities, unrivaled amenities, and 174 acres of private open space backing to National Forest. This new construction home sits on a fantastic elevated lot. Details of this 6,187 square foot custom home include 6 bedrooms, 7 bathrooms, 8 decks, 4 fireplaces, and a 2 car attached garage. Aspects can be customized; options and upgrades will disappear as completion nears. Beautiful and meticulously designed chalet home under construction in exclusive Timber Trail. Well cared for Frisco home located in a very quiet setting, yet just 2 blocks from Main Street. Great home in coveted Wellington neighborhood. Open floor plan with incredible light and views throughout. This outstanding residence at the Ranch at Eagles Nest is in a luxurious golf course community. 3 bed, 3 bath, 1,880 square foot ski-in end unit. Attached garage. Luxurious furnishings. Overlooks Snake River. True newer 1 bed, 1.5 baths, ski-in/out residence. Full service amenities on-site and a short walk to town. 2+ acre lot with breathtaking views of the Breckenridge ski area, entire Ten Mile Range and golf course. 10.32 acre lot just 5 minutes from town with great Breckenridge ski area views. Nice 1 acre lot in Baldy Ridge with amazing Breckenridge Ski Resort and Ten Mile Range views. The Tudor Rose Inn, on 37 pine forested acres, offers big sky vistas framed by mountain peaks. Purchase includes real estate as well as strong cash flow business. Main building has 7 bedrooms and 7 bathrooms. Five 2 bedroom chalets built in 2007 attract frequent repeat guests, with kitchens and fireplaces. Horse barn, stable, paddocks and fenced pasture makes it an ideal horse property. Three wells produce abundant water. Adjacent to Town of Salida property and BLM land with year-round recreation. Rare chance to own 3 businesses. The Old Red Barn, Silver Scoop Ice Creamery, and South Park Steakhouse. Timber peg construction on 35 acres with views. 4 beds, 5.5 baths, 4,906 square feet. Luxury attention to details. 4 bed, 2 full + 2 half bath log home on 3.3 acres with fishing stream. 26-foot ceilings, deck with hot tub, views. True mountain retreat with 35 acres, 4 beds, 4 baths, unobstructed mountain views, yet minutes to town. Spectacular panoramic mountain views and an absolutely gorgeous custom log home on over 5 acres. Beautifully furnished custom home in the heart of Winter Park with gorgeous mountain views. 4 bedroom, 3.5 bath home on 6 acres with huge views. Turnkey, high-end finishes, 2 decks, passive solar design. 3 bed, 2.5 bath, 2,148 square foot home on Sacramento Creek. 10 secluded acres, precision crafted residence. Planned Unit Development opportunity along the eastern corridor. 9.7 acre combined tract. 46 units. 3 bed, 3 bath, 3,040 square foot home on 1.5 treed acres. Mountain views, main floor living. Potential lock-off. Beautiful custom home in Placer Valley located only 20 minutes from Breckenridge. Spacious, remodeled kitchen, open floor plan, fully furnished. 3 beds, 2 baths, 1,848 square feet, mtn views. Quality log home on 159+ acres. 360 degree mountain views and all day sun. Convenient location. Cozy, private, on 5+ acres with views to Pikes Peak. Open living area, 3 bedrooms, hardwood flooring. Great commercial or residential space on Main Street in Fairplay with easy access and great exposure. performed by the National Repertory Orchestra. LIV SIR sponsors the opening night of the New York Philharmonic with broker, Matthew Blake. for Sudden Cardiac Arrest awareness. THE SUMMIT FOUNDATION 9.5.2015 / Breckenridge, CO LIV SIR supports the Summit Foundation’s 28th Annual Great Rubber Duck Race. Your Local Source for Luxury, Lifestyle and Everything in Between. in Breckenridge will not disappoint. destination for an après ski cocktail. of never having to leave the Vail Valley. for the neighborhood’s best martini. installations for over 30 years. of books, toys and unique gifts. works of art that will last a lifetime. Aviator Nation, and Tea Collection. Miami design, with clothing by Anatomie, one of the boutique’s top selling brands. With collections designed in Miami and made in Italy, Anatomie clothing is created with the active modern woman in mind, with styles that easily transition from day to night. Nowhere else in the United States can these exclusive fashions be found. INTERNATIONAL APRÈS SKI: Frisco, Copper, Keystone, Breckenridge, Beaver Creek & Vail Après Ski, a tradition of socializing, entertainment and often libations following a day’s skiing is a pastime embraced around the world, and one truly celebrated in the Colorado Rocky Mountains. Just as plentiful as the skiing options in the Rockies, so are the options for après ski specialties from around the globe. PROST, FRISCO A quaint beer hall serving up the best beers and sausages this side of Bavaria. BRIAR ROSE SALOON, BRECKENRIDGE A historic back-bar tucked behind an award-winning Chophouse. DOS LOCOS, KEYSTONE A fun and friendly cantina, serving up authentic Mexican cuisine. LA TOUR, VAIL VILLAGE A French bistro passionate about creating lasting memories through carefully crafted dishes. MATSUHISA, VAIL VILLLAGE Premium sushi and sashimi, presented by the master of Japanese cuisine. BAGALIS, FRISCO/COPPER Classic Italian with an international influence serving up rustic, yet sophisticated cuisine. 2.2-15.2015 / Vail/Beaver Creek, CO LIV SIR brokers attend the races. LIV SIR welcomes Ascent SIR to the family. LIV SIR GARNERS TOP HONORS AT LUXURY REAL ESTATE CONFERENCE 10.6.2015 / Seattle, WA LIV SIR awarded Best Digital Marketing Strategy and broker, Malia Cox Nobrega, earns Outstanding Rookie award. LEADERS IN LUXURY CONFERENCE 10.5.2015 / San Juan, Puerto Rico LIV SIR broker, Bart Peaslee, presents at The Institute for Luxury Home Marketing’s annual Leaders in Luxury conference. LIV SIR ATTENDS RUSS LYON SOTHEBY’S INTERNATIONAL REALTY’S REGIONAL NETWORKING EVENT 11.18.2015 / Scottsdale, AZ LIV SIR broker, Tye Stockton, speaks on the ‘Art of Promotion and Referral’ panel. The information presented herein is proposed and should not be relied upon as a basis for purchasing since all elements are subject to change, refinement or elimination by the developer without notice. Prices and availability are subject to change at any time without notice. The Ritz-Carlton Residences, Vail are not owned, developed or sold by The Ritz-Carlton Hotel Company, LLC. RCR Vail, LLC uses The Ritz-Carlton marks under license from The Ritz-Carlton Hotel Company, LLC. The Ritz-Carlton Residences, Vail are being developed and sold by RCR Vail, LLC an affiliate of Vail Resorts Development Company. Designated trademarks are the property of Vail Trademarks, Inc. © 2015 Vail Resorts Development Company. Sotheby’s International Realty and the Sotheby’s International Realty logo are registered (or unregistered) marks used with permission. Each office is independently owned and operated. This is not intended to be an offer to sell nor a solicitation of offers to buy real estate in The Ritz-Carlton Residences, Vail by residents of CA, CT, HI, ID, NJ, NY, OK, and OR, unless registered or exemptions are available, or in any other jurisdiction where prohibited by law.